Car 400 as is exists today. Bamberger 400 is a classic Niles coach. The 400 was built in 1910 by the Niles Car and Manufacturing Company of Niles, Ohio. 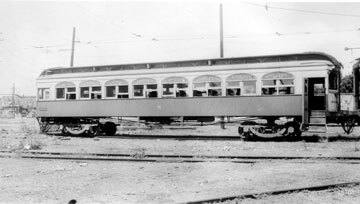 It was built for the Salt Lake and Ogden, a steam operated short line that was converting to 750 volt electric trolley for both freight and passenger operation. Car 400 ran between Salt Lake City and Ogden, Utah. 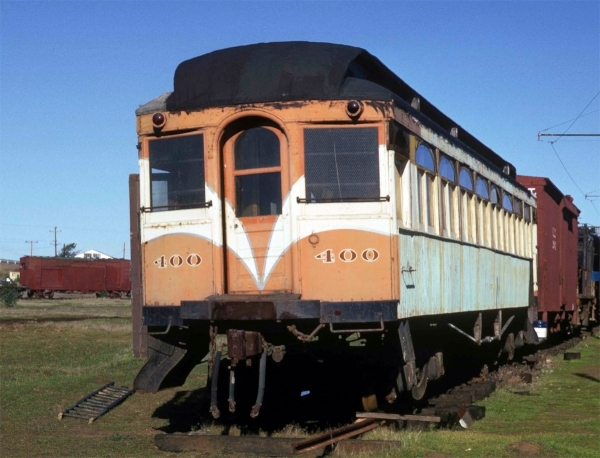 It was built as SL and O car 403, a non-powered single compartment coach trailer. In August 1917 the name of the railroad was changed to the Bamberger Electric Railroad and the car became BER 403. The depression hit the Bamberger hard and it went in to receivership in 1933. The company was reorganized and came out of receivership in July 1939 as the Bamberger Railroad. All passenger operation was discontinued on September 7, 1952. Car 400 was sold to a private collector shipped to Oakland and stored there. The car was then sold to a second collector. It eventually passed to the Bay Area Electric Railroad Association. Owners: Bamberger 400. Bamberger 320. Bamberger 403. SL&O 403. Technical Data: Wooden Niles coach control trailer. Built by the Niles Car Company of Niles, Ohio in 1910. Seats 64 passengers. Weight, 54,000. Trucks: Baldwin 79-33 AT. Wheels, 33 inch. Axle, 5 1/2”. Journals, 5 X 9. Air Brake Equipment: Westinghouse Traction Brake, AMM. Motorman’s valve, M-24A. Triple valve, M2A. Brake Cylinder. Dimensions: Width, 9’ 0”. Length, 57’ 8”. Height, 13’ 0”. Truck centers, 34’ 6 3/4”. Truck wheelbase, 79”. Propulsion Equipment: General Electric. Master controller, C-36. Control switch, MS-14 and MS-46. MU plugs. Misc Data: Couplers, Janney Radial MCB 1904 contour. Heaters. Proposed Future Treatment: This car has been modernized. The Association needs to determine if it should be returned to the classic Niles appearance or be keep as it came out of service. The car has been damaged in a switching accident and needs some underframe repair. Car needs minor repairs, cleaning, painting and a new canvas roof.